Science can be super cool to try and super easy to set up at the same time. Let’s show kids how cool science can be! 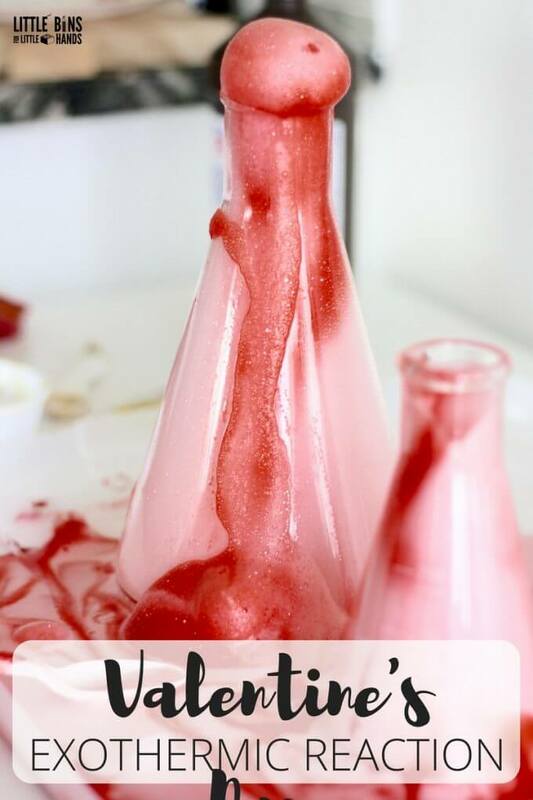 We have loads of simple experiments you can easily do at home or in the classroom. 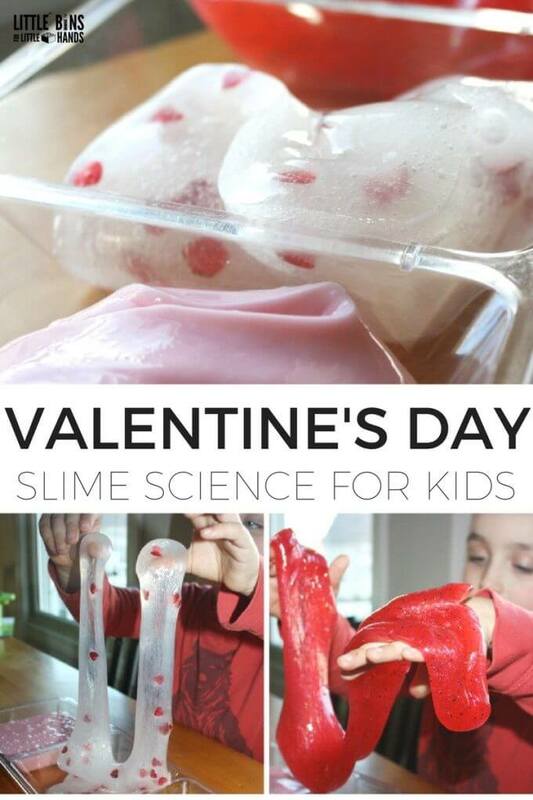 Now you can also add a cool theme like Valentine’s Day to make science projects for kids even more fun. 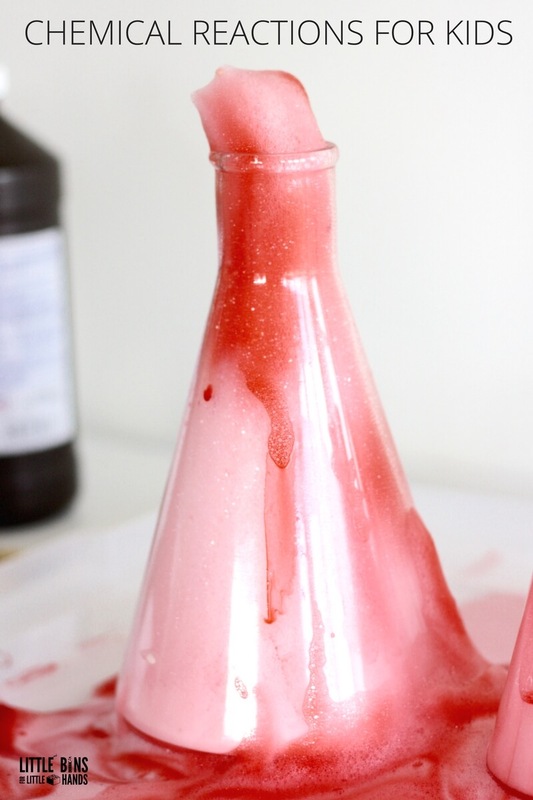 This Valentines Day hydrogen peroxide yeast experiment is a must try experiment for a real WOW! 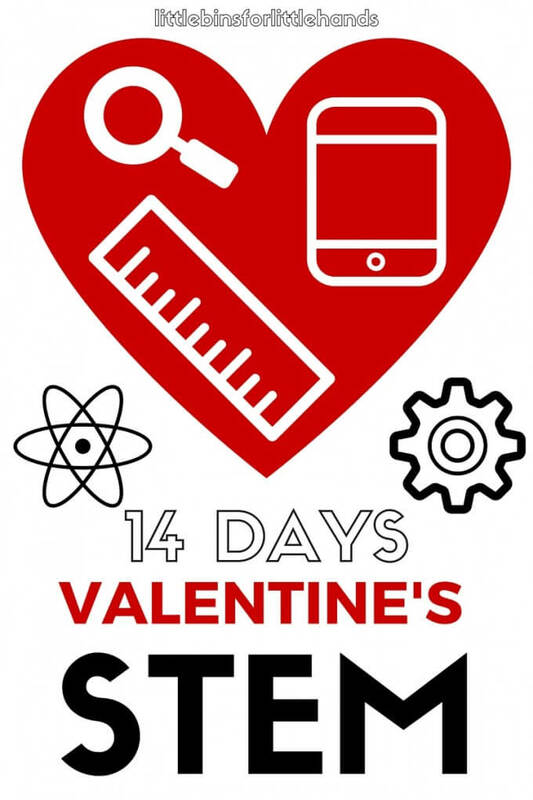 BOOKMARK ALL OUR GREAT IDEAS FOR VALENTINES DAY CHEMISTRY HERE. 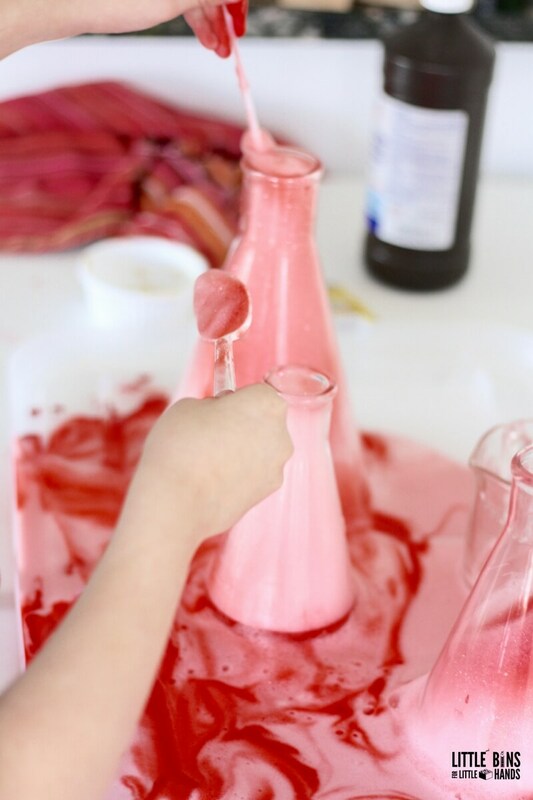 The reaction between the hydrogen peroxide and the yeast makes this awesome foam that is perfectly safe for little hands to play with and a breeze to clean up. This is not edible! We love cool fizzing, foaming, erupting chemistry. 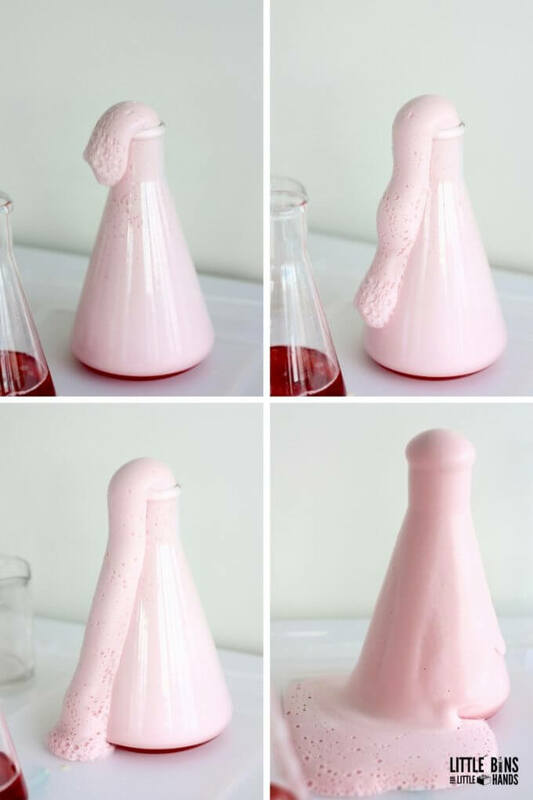 Check out the awesome photos below and at the end, you will see everything you need to make your own Valentines Day hydrogen and yeast experiment. 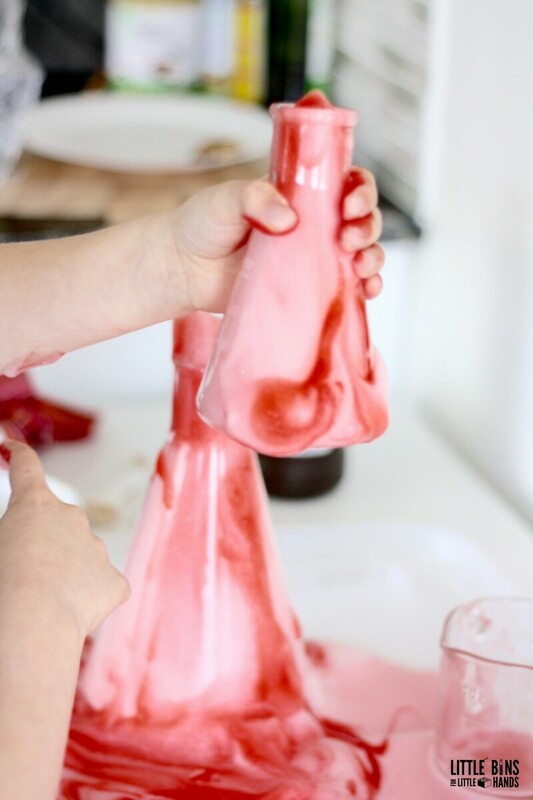 One of the best parts of this Valentine’s Day science experiment is the opportunity for tons of hands-on play and exploration. 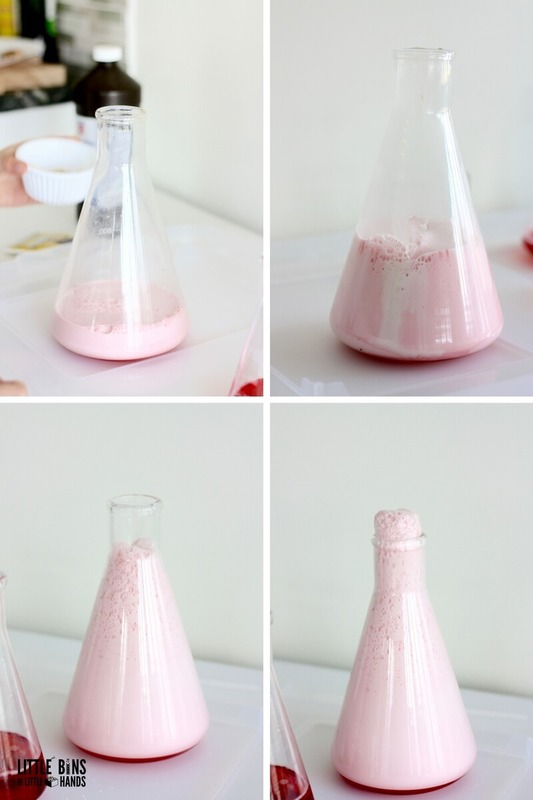 This hydrogen peroxide and yeast science activity encourage kids to explore the reaction with their hands! 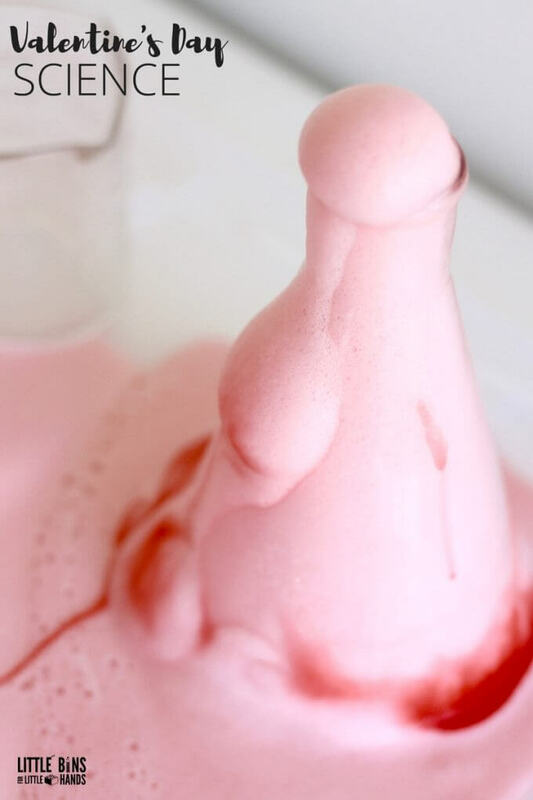 This classic chemistry experiment is often called elephant’s toothpaste because of the voluminous amount of foam that it usually produces. However, you do need a much stronger percentage of hydrogen peroxide to produce that reaction. You can still enjoy the same type of chemistry experiment but with less foam and less of an exothermic reaction with regular household hydrogen peroxide. The experiment is still awesome, and if you get a chance to try a higher percentage of peroxide, it will be worth it too. 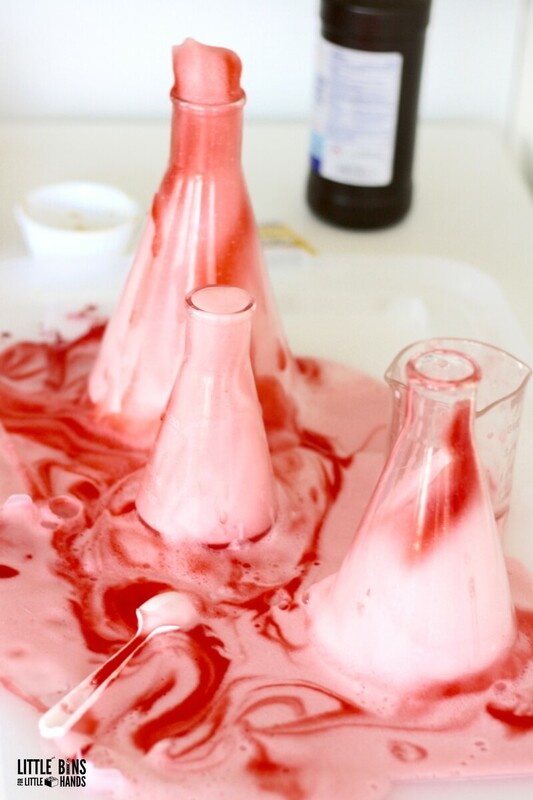 We, of course, love the holidays here, so it’s fun to give our classic science experiments the theme of the holiday we are approaching. 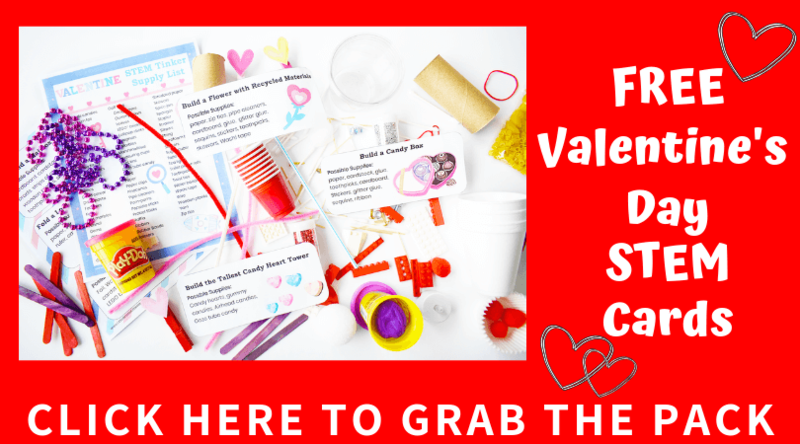 Right now we are getting excited for Valentine’s Day! 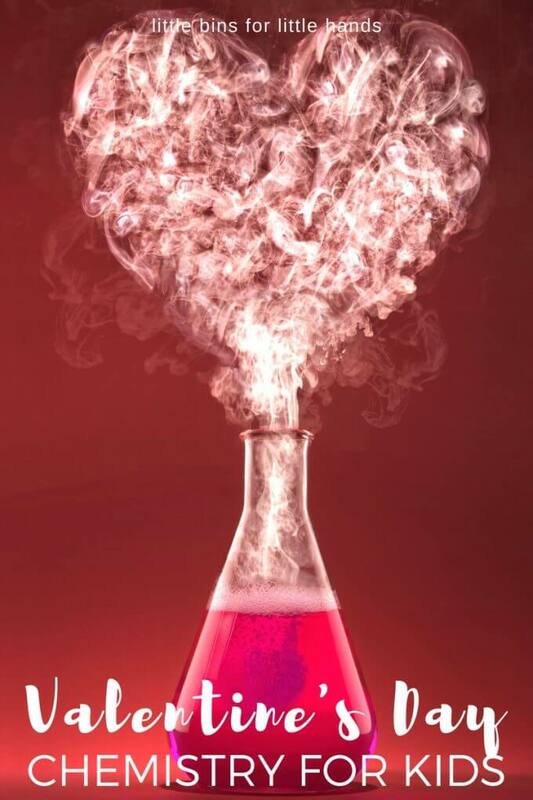 So Valentines Day chemistry it is! Pink and red and hearts are added to most of our Valentines Day science activities and this Valentine’s Day hydrogen peroxide and yeast chemistry experiment have plenty of pink and red! 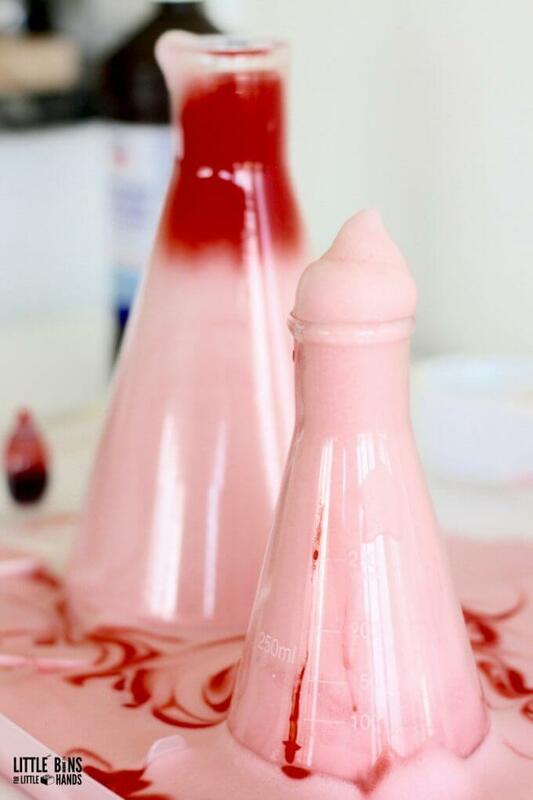 Food coloring is a super simple way to give science a holiday theme. My son is also very generous with his food coloring use. The reaction between the hydrogen peroxide and the yeast is called an exothermic reaction. You will feel a warmth to the outside of the container because energy is being released. The yeast helps to remove the oxygen from the hydrogen peroxide creating tons of tiny bubbles that made all that cool foam. The foam is the oxygen, water, and dish soap that you added. If you pay close attention, the reaction continues for quite a while and looks quite different depending on the size of the container you use! We chose three different size flasks to check out this Valentines Day hydrogen peroxide yeast exothermic reaction. Each one looked pretty cool. 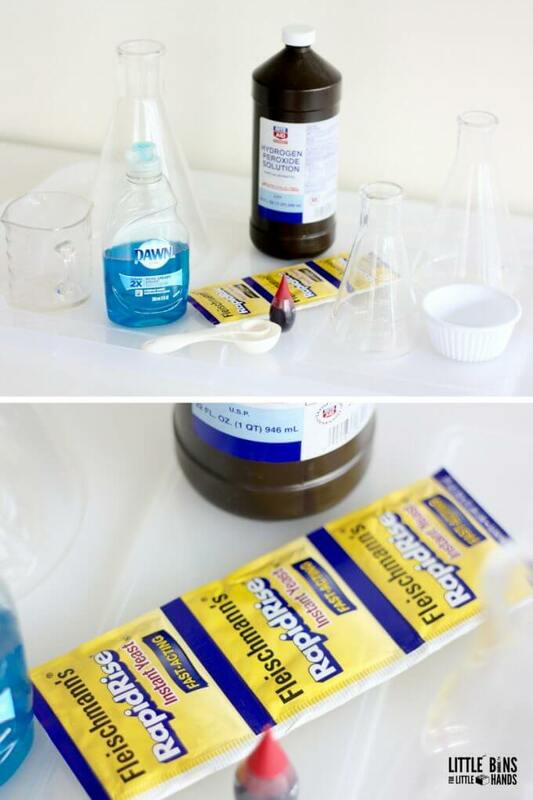 Pour the same amount of hydrogen peroxide into each container unless you are just using one container. We used a 1/2 cup. Squirt dish soap into flask or bottle and swish it around a bit to mix! Add food coloring (as much as you like, my son is very generous). Mix 1 tablespoon of yeast with 3 tablespoons of very warm water. Stir to dissolve the yeast as best as possible. It may appear clumpy still but that’s fine! Pour the yeast mixture into the container and check out what happens! 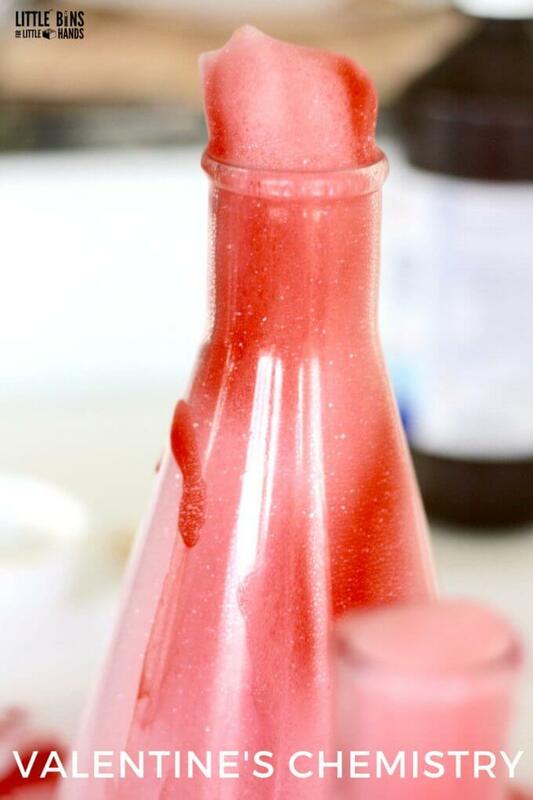 You can even add a few more drops of food coloring as the mixture swells out of the container. Notice how quickly the reaction begins. The foam had started before he was even finished pouring in the rest of the mixture. For the larger flask, the reaction continued for quite a while inside the container before it came out of the top. Would a different amount of hydrogen and yeast change that? Check out all that cool foam being produced by the reaction between the hydrogen peroxide and the yeast! FOAMY, AWESOME SCIENCE PLAY WITH A VALENTINES DAY HYDROGEN PEROXIDE YEAST EXPERIMENT! Go ahead and play around with the foam. My son added additional red food coloring. This will temporarily stain the hands if you use as much as my son! If we stayed with the pink foam this would not have happened. You can also go ahead and whip up new yeast mixtures and add it with extra hydrogen peroxide to the already foamy bottles or flasks. 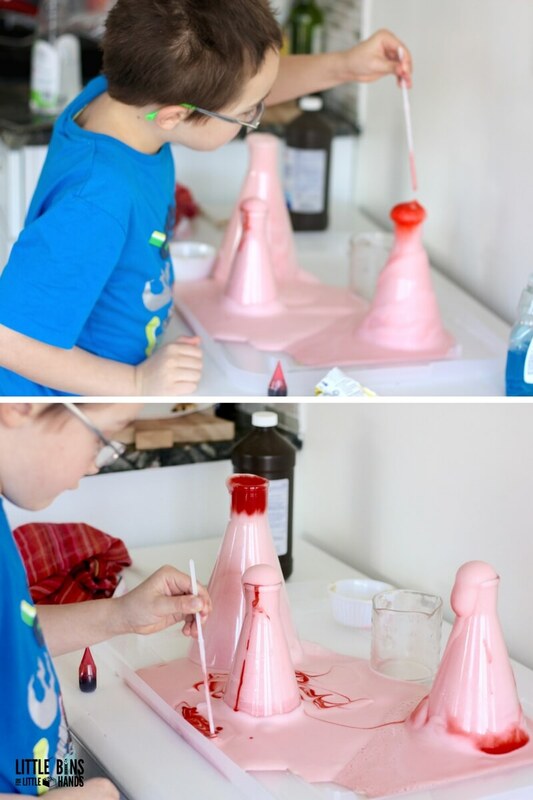 We always do this with our baking soda and vinegar reactions! Playing around with hydrogen peroxide and yeast has been a new kind of chemistry experiment for us this year. 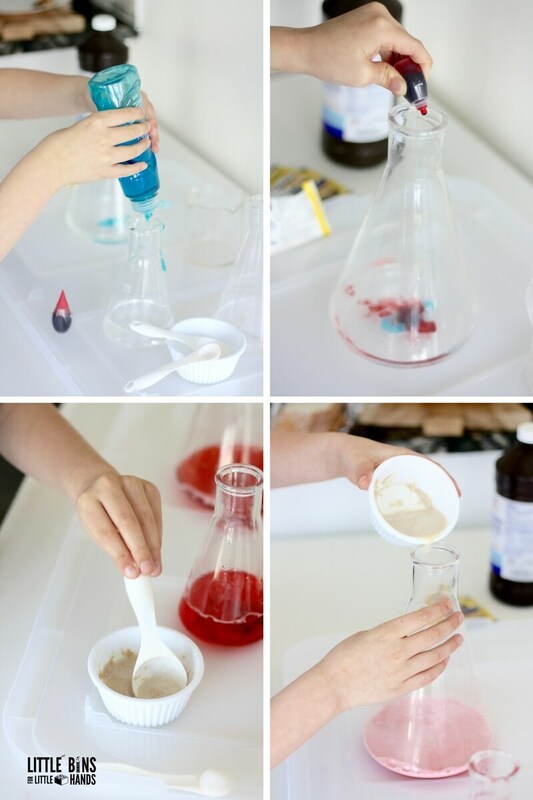 We usually use the classic baking soda and vinegar experiments for many of our themed science activities. Time to try new things! 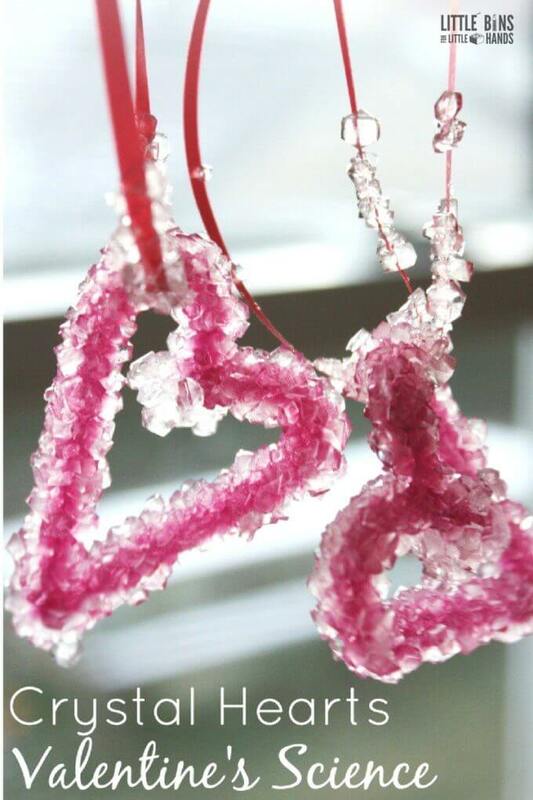 FUN VALENTINES DAY HYDROGEN PEROXIDE YEAST EXPERIMENT! Check out more awesome science and STEM this season and all year long. Click on photos for more ideas.